My first experience has been pretty well documented already, so I shall not repeat myself… But I do wonder if the Turkey made it to January. I am almost inclined to go visit the place just to find out! And it’s true that I had quite a lot of misgivings and in my own inimitable way made a stupid amount of fuss about the whole thing! 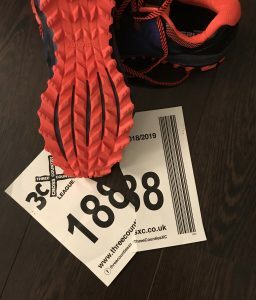 Will my trial shoes get used again? YES… (and for those that care, the picture is them AFTER three races, but having been given the toothbrush treatment). This is a completely different experience to the dreaded school XC. Even though that is obvious really, just the words CROSS COUNTRY conjures up bad memories. And of course the irony of now paying to do something that years ago you would do ANYTHING to avoid. If you have never done it, then just it give it a go. It felt a world apart from a Tri event… Which frankly can be quite intimidating the first few times as everyone seems to know what they are doing, you can’t move for flashy equipment and the RULES are never ending. Only second to the equally gigantic and never ending ego’s. Cross Country is the polar opposite! It almost has an underground, grass routes, rustic feel to it (could a cram any more puns in!! )… But my overarching memory was just how friendly everyone was and made me feel so welcome. There were some VERY fast people and some VERY slow people and it didn’t matter a jot. It was completely non-judgemental and everyone was just there to have a good time. Imagine a slightly longer, slightly hillier version of a Park Run and you won’t be far off imagining how ‘safe’ it feels. (Don’t for Christ sake take a buggy though… It is a bit more serious than that!!). There are no medals… But actually it would be ‘wrong’ if there were. Instead you get a cheese roll and some cake. Lots of cake. And a cup of tea. You don’t need a medal.